- 殘編 (Tanya Hsu) on 四月 25, 2015. 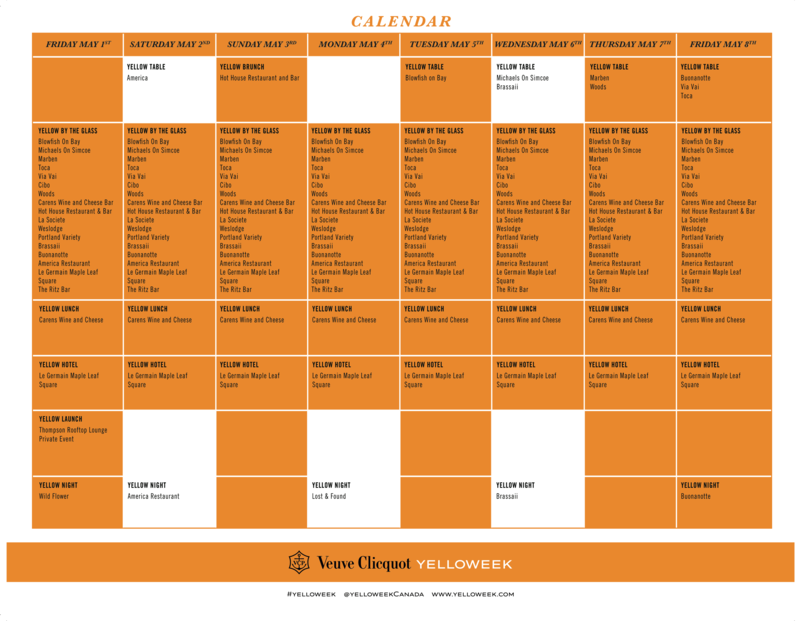 We are 5 days away from the 2015 launch of our favourite champagne house Veuve Clicquot’s Yelloweek, a weeklong, festival-style tribute to creativity (& champagne!). During Yelloweek, participating restaurants, hotels, and lounge bars will be showcasing the legendary qualities of Veuve Clicquot and the “joie de vivre” the brand is known for by interpreting this year’s theme, ‘Let Life Surprise You’. A series of one-of-a-kind events will be running simultaneously nationwide in the cities of Toronto, Vancouver, Montreal, Calgary and Edmonton: The Yellow TABLE will feature an exquisite series of dinner with champagne pairing at the finest restaurants in each city; Yellow HOTEL will be offering luxurious stays at Hotel Le Germain filled with Veuve Clicquot surprises; Yellow ART will showcase stunning artworks created by Canadian artists; Yellow NIGHT will be showing the “zeste de folio” spirit of Veuve Clicquot with late-night parties; Yellow By The GLASS will share the joy of Veuve Clicquot throughout the cities; and Yellow CONTEST will give you the opportunity to share the Veuve Clicquot happiness at home.